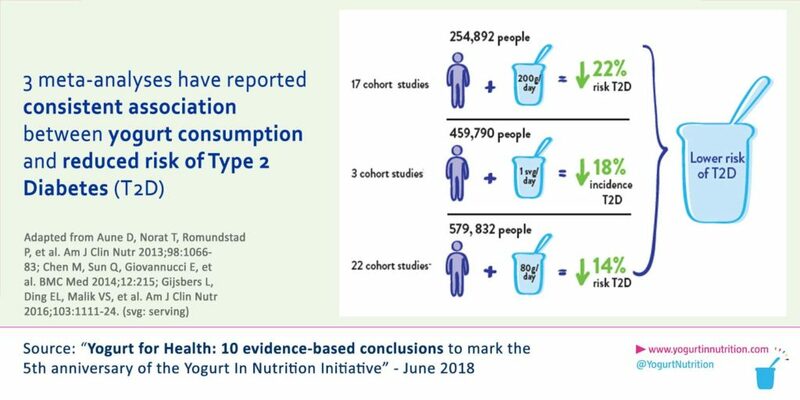 Three meta-analyses have reported a consistent association between yogurt consumption and reduced risk of Type 2 diabetes (T2D). Whole-fat yogurt appears to be best – contrary to the recommendations of most dietary guidelines advocating low-fat dairy products for adults. In contrast, when low-fat yogurt was eaten in place of whole-fat yogurt, there was a 17% higher rate of T2D per serving per day substituted. Aune D, Norat T, Romundstad P, et al. Dairy products and the risk of type 2 diabetes: a systematic review and doseresponse meta-analysis of cohort studies. Am J Clin Nutr 2013;98:1066–83. Chen M, Sun Q, Giovannucci E, et al. Dairy consumption and risk of type 2 diabetes: 3 cohorts of US adults and an updated meta-analysis. BMC Med 2014;12:215. Gijsbers L, Ding EL, Malik VS, et al. Consumption of dairy foods and diabetes incidence: a dose-response metaanalysis of observational studies. Am J Clin Nutr 2016;103:1111–24. Ibsen DB, Laursen ASD, Lauritzen L, et al. Substitutions between dairy product subgroups and risk of type 2 diabetes: the Danish Diet, Cancer and Health cohort. Br J Nutr 2017;118:989–97.